Functional groups increase the utility of polymers and are fundamental to the development of many aspects of structure-property relationships. The functionality present on the monomer units determines the solubility of the polymer in a given solvent. One can control the hydrophilicity/phobicity, or polarity of a copolymer, and the elasticity or modulus of a material by selecting appropriate monomers. End functionalized polymers are used for blend compatibilization during reactive processing and in many thermosetting compositions e.g. epoxy-functional polymers and functional materials form the basis of the majority of products prepared for dispersant, coating, adhesive, and sealant, etc. applications. These approaches are summarized in the following scheme. The most obvious way to incorporate a single functionality at the polymer chain end is the use of functional initiators. This approach can be used to prepare either homo- or hetero-telechelic polymers. Use of a mono-functional initiator with desired functionality leads to direct α-functionalization of the polymer and no post-polymerization modification is required. 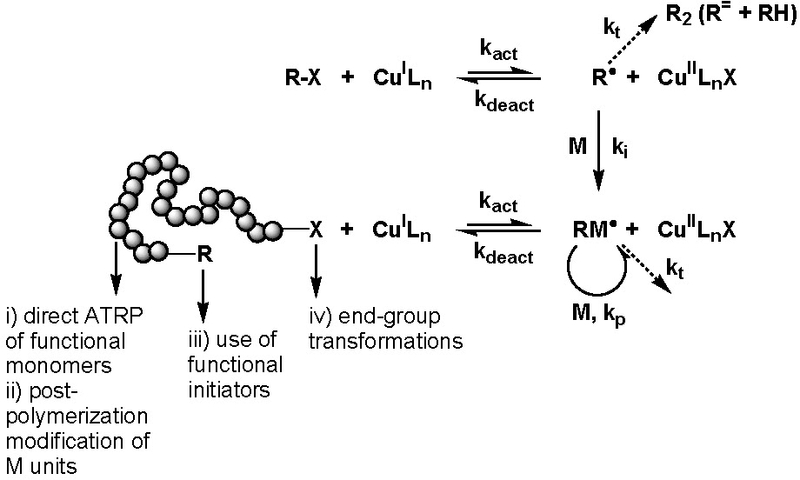 In the vast majority of ATRP reactions the active, or growing, polymer chains are halogen-terminated, and can be further used as macroinitiators in chain-extension reactions or the initial functionality can be viewed as precursors of ω-end-functionalized polymers through end group transformations, route iv). (1) Tsarevsky, N. V.; Matyjaszewski, K. ACS Symposium Series 2006, 937, 79-94. (2) Tsarevsky, N. V.; Bernaerts, K. V.; Dufour, B.; Du Prez, F. E.; Matyjaszewski, K. Macromolecules 2004, 37, 9308-9313. (3) Golas, P. L.; Tsarevsky, N. V.; Matyjaszewski, K. Macromol. Rapid Commun. 2008, 29, 1167-1171. (4) Coessens, V.; Pintauer, T.; Matyjaszewski, K. Prog. Polym. Sci. 2001, 26, 337-377. (5) Davis, K. A.; Matyjaszewski, K. Advances in Polymer Science 2002, 159, 2-166. (6) Braunecker, W. A.; Matyjaszewski, K. Progress in Polymer Science 2007, 32, 93-146. (7) Tsarevsky, N. V.; McCarthy, P.; Jakubowski, W.; Spanswick, J.; Matyjaszewski, K. NSTI Nanotech, Nanotechnology Conference and Trade Show, Technical Proceedings, Boston, MA, United States, June 1-5, 2008, 2, 665-668. (8) Matyjaszewski, K.; Tsarevsky, N. V. Nature Chemistry 2009, 1, 276-288.